Variety is an important part of life. Nothing is constant and this is a good thing when it comes to food. This coming June and July, the CAFE at the HYATT in Manila would be serving its patrons two different and very distinct food festivals. The CANTONESE FOOD FESTIVAL starting JUNE 14 and the INDIAN FOOD FESTIVAL starting July 17. 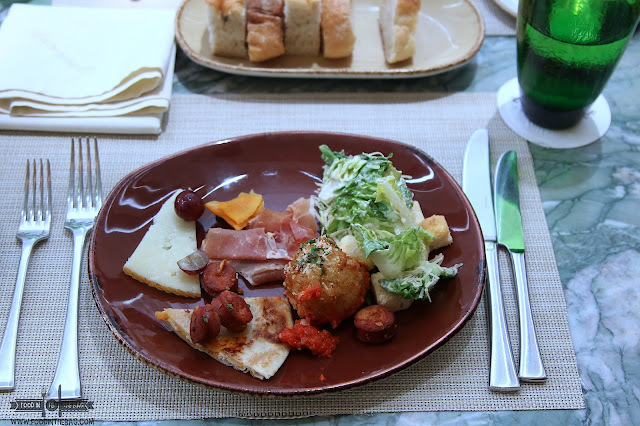 The Cafe, located at the ground floor of the Hyatt Hotel City of Dreams, is an excellent place to enjoy and partake of good food and excellent service. Once you enter you are greeted and escorted to your table. As you pass the long buffet line, you can't help but wonder why only now. Cozy circular booths are available and even private rooms for the discerning guests. The Cafe is an interactive kitchen. If one wants something, they make it happen. That is what makes the CAFE special. Right from the get go, a barrage of appetizers are available in a huge section in the middle of the hall. Different types of salads, greens and dips are placed for your heart's content. Freshness is an important part so I was pleased when I saw a small wooden pot that contains different herbs that you could pluck and get right there and then. If you aren't familiar with the how's, don't worry as you could request the staff to make your very own healthy salad. The Japanese section is also impressive. Here, you get to ask for your personalized donburis or rice bowl and even pick a couple of edamame to start. You get to have a choice of aburis and different Japanese rolls. If that is not for you, you could request for some salmon or tuna slices. Here, they don't served it cut on a plate. Rather, they slice it when you request for it. Making sure that the standard of freshness is maintained. Aside from the different Japanese starters, there are an abundant choice of cheese and cold cuts ready for the taking. More than the crostinis and other delicacies, you have an unlimited supply of JAMON. This salty and thinly sliced pieces of meat is a joy to eat. Partner it with different cheeses, bread and some sparkling wine and you are good to go. Living up to its fame, they have live action stations. One of the most visited is the pasta and pizza section. Here, you could ask for any noodle dish you may want to try out. For something light, maybe an Aglio et olio which basically means garlic and oil. Add some chili peppers for some heat. Aside from the stations that houses the cooked dishes like tempura or that amazing corn dog or even sisig, I enjoyed the fresh seafood area. Here, you could ask for the shrimps, clams and shells to be cooked based on your preference. Personally though, I like them fresh with a little bit of lemon and some hot sauce. One crowd favorite would have to be the carving area. Here the HUGE BEEF is sliced and even other roast meat are served. The meat are so tender and the sauces so beautifully done, I am seriously drooling right now just remembering it. Also part of this station are the different skewers, lamb, and other meats that you may want or request to be cooked. Aside from this lineup, the different food festival would be able to tickle your fancy. You get to have more dishes to choose from. From June 14-19 the CAFE would be having their CANTONESE FOOD FESTIVAL. Chinese food galore. During this event, the restaurant would be inviting CANTONESE CHEFS Xi Qing and Zhao Pan Fei to cook for the guests and showcase their culinary talents. We were given a little sneak peak into the different dishes that they plan to serve and I must say the patrons of this buffet would be in for a treat. I personally enjoyed the roasted part of the meal as they plan to include some pork, chicken and even ribs masterfully cooked into that specific Chinese cooking. The following month from July 17 to the 24th, the CAFE would be hosting excellent Indian Chefs for the INDIAN FOOD FESTIVAL. Indian delicacies would be served including Aloo Chat, Paneer Makhani and even kebabs and curries. Don't worry if you don't know or even can't pronounce the different dishes. I can assure you that they taste wonderful as the spices are all legit and excites the senses. To end the meal, don't forget to browse through the long dessert spread and get from their soft serve ice cream. Also, kids and kids at heart would appreciate the different chocolate based goodies that their pastry chef conjured up. Delicious. Again, I can't wait for CAFE at The HYATT's up and coming food festivals. The Cantonese Food Festival on June 14-19 and the Indian Food Festival from July 17-24. Even without these food festivals, I will definitely return. Hope to see you guys there. Dinner at 1,888/1,988 Php Nett.